Content marketing and technology have become inseparable. To reach your customers effectively and to outsmart your competitors, you need to constantly hunt for innovative tools. One such tool that’s making everyone sit up and take notice is Prezi. Prezi is an almost futuristic tool that wouldn’t look out of place if it was being used by Tom Cruise in the movie “Minority Report.” Developed by Adam Somlai-Fischer — an architect known for his innovative experiments that blend technology, spaces, and human interaction — it helps people present and share ideas in an organized, storytelling format. It is a SaaS (software as a service) based presentation interface, and many businesses and individuals are already using it to share and explore ideas on the cloud. Prezi uses a unique zooming user interface (ZUI) to interact with users. The 2.5-dimension navigability (up-down, sideways, and depth) that Prezi offers is extremely powerful. 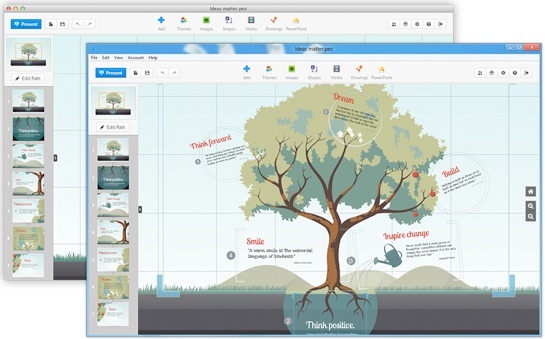 Although most people know Prezi for its online version, the company also offers a desktop variant, which lets you create offline presentations and later view them on Windows, Linux, and Mac platforms. Prezi eliminates the need for multiple slides in a presentation. On a Prezi — which is what each Prezi presentation is called — you zoom-in/zoom-out or pan-in/pan-out to move through the presentation, instead of jumping from one slide to the next. In other words, Prezi is a “non-linear” form of presentation, while PowerPoint and SlideShare are linear forms. Prezi uses a map to navigate through the presentation, instead of a slide stack that you encounter in traditional presentation tools. SlideShare, the social platform that takes the linear presentation format of PowerPoint online, allows users to upload and share presentations on the web. But even SlideShare doesn’t give you the extra dimension of depth offered by Prezi. However, SlideShare has one big advantage over Prezi. Any content inside a SlideShare presentation is searchable and can be indexed by search engines — Prezi does not give you this benefit. What’s in it for content marketers? If you are a content marketing strategist, the amazing zooming user interface of Prezi will bring a smile to your face. Sure, it is unfamiliar territory, and most people have yet to experience the power that Prezi can lend to content marketing campaigns. 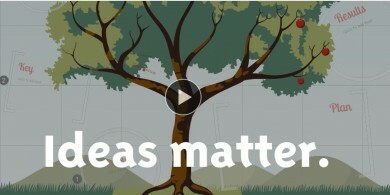 But what makes Prezi perfect for your content strategy is that it is a great storytelling tool. It allows you to guide the attention of users and lead them through your message, keeping their eyes locked on the screen. Prezi is a rich medium, and you can use videos and images within your presentation, as well as include one in your blog, share it on your social networks, or embed it on your web pages. You can even use Prezi offline in a digital out-of-home (DOOH) campaign. The best part about using Prezi for content marketing is that not many are using it yet, and the novelty itself will make your customers take notice. Several leading companies have jumped on the Prezi bandwagon, though for varied applications. Some use it in business meetings and presentations; others use it during trade shows and marketing events to engage with customers. Companies like Coca-Cola, Lenovo, and CBS are already experimenting with Prezi for their content strategy. 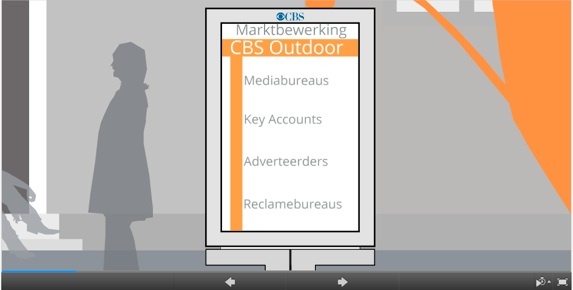 CBS Outdoor used a Prezi on the theme “media on the move,” which was later featured on billboards across the Netherlands. 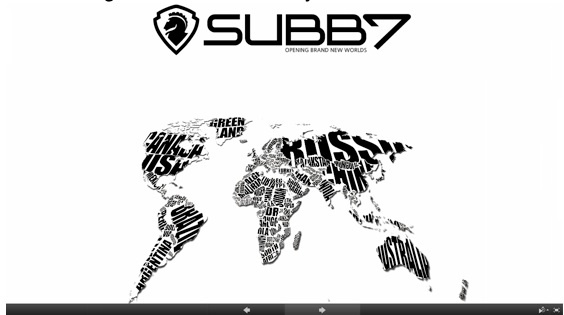 Subbseven, an online lifestyle platform, created a Prezi that demonstrates its designs in a beautiful way. Ogilvy has used Prezis to promote many of its clients in collaboration with Mr. Prezident, a company that helps create Prezis. TomTom, the world’s leading brand for navigational devices used a Prezi for its annual global marketing conference in Dublin. Coca-Cola has made a unique Prezi that explains its strategy for 2020. TMP&Co, the Dutch unit of TMP Worldwide, featured a looping Prezi during the Amsterdam International Motor Show. Lenovo has gone one step further to create its own unique Prezi template for its employees. Rijksoverheid, the Civil Service Agency for the Dutch Ministry of Foreign Affairs, has found a creative way of educating its officials on iPads with an interactive Prezi. Ubuntu Street Kids Foundation also used a loop that was featured in its annual “Geod Bedoeld Festival”. This loop is present online and has been shared and embedded by many people on the internet. CBRE, a commercial estate services firm, made a Prezi to attract prospective interns. Orange Babies a foundation for pregnant women infected with AIDS has created a Prezi named What is Sweet Links? that aims at spreading AIDS awareness. How you use Prezi in your content strategy is entirely up to you, though try not to reinvent the wheel. Take inspiration from companies that have already used Prezi — i.e., use their strategies as a template to get familiar with the tool, and then move to more innovative applications. The content that you share through Prezi should be chosen carefully. It should be such that the extra dimension reveals insights that would be difficult to highlight otherwise. For example, you could use a Prezi to publish richer and more interactive infographics about your industry, zooming in on different data representations in a predetermined sequence. Don’t forget that Prezi does present a limitation of not being SEO friendly, as search engines will not be able to read its content (at least not yet). So when you create a Prezi, make sure that it is accompanied with textual content that allows search engines to better understand the content in your Prezi. This will make it easier for your target audience to discover your Prezi, and also connect the Prezi semantically with the rest of your content. Looking for help choosing and implementing the right technologies for your content marketing plans? Read our Decision-Maker’s Guide to Making Smart Content Marketing Technology Choices. Jessica Davis is a Content Strategy Specialist with Godot Media. She has years of experience, working closely with online businesses, helping them refine their marketing strategy through content. Her other interests, besides online content strategy and internet marketing, are technology and fashion. You can read her articles at the Godot Media blog.